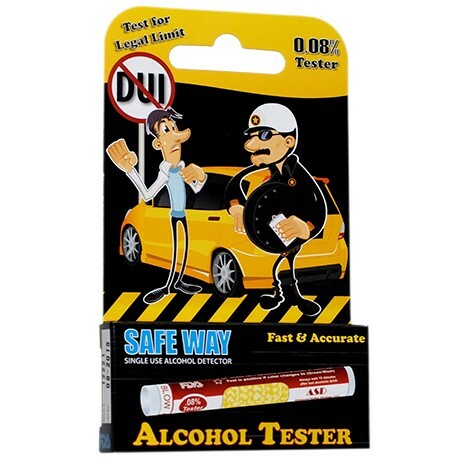 The Safeway Disposable Alcohol Tester is the perfect solution for making a quick assessment of a subject's degree of intoxication. The Safeway is a no fuss one time use disposable alcohol detection unit. This chemical breathalyzer is a compact and cheap way to ensure that you are safe to drive. In jobs that require a strict no alcohol policy our .02% detector ensures compliance. The Safeway will find uses in diverse environments from law enforcement and businesses to jobs involving heavy machinery and hazardous material handling. This one-time use breathalyzer provides quick and accurate results for a sobriety check. The Safeway Alcohol Detector is a colorimetric alcohol detection system. 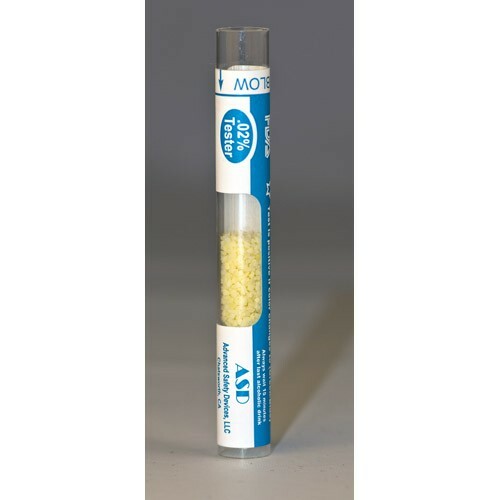 The specially coated crystals in the tube will change color on exposure to ethanol. Using the Safeway is as simple as breaking the tube, exhaling onto the device and watching for the color change. The Safeway provides a quick low cost alternative for determining intoxication. The Safeway testers come in four different alcohol sensitivities: 0.02%, 0.04%, 0.05%, and 0.08%BAC. The low cost and ease of use make the SafeWay testers ideal screening tools. The single use feature provides a safeguard against contamination and unsanitary mouthpieces. This makes it a great choice for use with the Armed Forces, schools, police check points, prison populations, and employee alcohol screening. This unit detects alcohol through a special chemical reaction that induces a colorimetric change. In order to perform a test, simply break the ampoule containing the SafeWay crystals and blow into the unit. If the crystals change color, then alcohol is present in the subject's breath. The SafeWay alcohol test comes in four models to cover a wide range of testing requirements. The .02% tester is our most sensitive chemical test and can detect very small traces of alcohol. This test is useful in enforcing strict adherence to no alcohol policies for operators of heavy machinery, airline pilots, railway workers and other jobs that require zero alcohol tolerance. The criminal statutes defining alcohol intoxication levels vary between states and countries. To account for these different DUI laws we manufacture .04%, .05%, and .08% testers. The test relies on a very sensitive chemical reaction between the ampoule’s crystals and the molecules of ethanol in the subject's breath. This reaction produces a distinct color change and provides a quick way to assess the level of alcohol influence. The SafeWay crystals are insensitive to all other gases and therefore will not produce any false positive test results. The SafeWay device has received FDA clearance as well as NHTSA/ DOT test approval as a disposable, single use breath alcohol tester. It was shown to produce accurate and reliable measurements of human breath alcohol contents (BrAC). The chemical reaction utilized in the alcohol test is highly specific and does not produce false positives. How the SafeWay Works? During the metabolism of alcohol, a certain percentage of the ethanol travels through the arterial circulation and escapes the body during the breathing cycle. The determination of blood alcohol concentration and presence is based on a chemical reaction between the exhaled ethanol and the specially coated crystals of the SafeWay unit. In the presence of ethanol the breathalyzer crystals change color to indicate a positive test for alcohol. The test utilizes silicon crystals that are coated with a compound that is very sensitive and specific to the presence of ethanol. The SafeWay disposable alcohol test keeps the crystals fresh in a hermetically sealed glass ampoule until the test is administered. Immediately prior to use, the ampoule is ruptured by slight finger pressure on the outer flexible clear tube to release crystals within the confines of the tube. The crystals react upon exposure to the test subject's breath by changing color from yellow to white and finally blue. If all of the crystals turn blue, the person's blood alcohol is at or above the %BAC of that particular test. These tests can be used to measure blood alcohol concentration levels of .02%, .04%, .05%, and .08%. The disposable breathalyzer provides a convenient and accurate colorimetric test based on well understood chemistry. This reliability makes it ideal for screening uses by law enforcement agencies. The SafeWay comes in different sensitivity levels ranging from .02%BAC to .08%BAC (blood alcohol concentration). The superbly sensitive .02% test is the perfect choice for environments where there is zero tolerance for alcohol use. All of the tests will detect alcohol concentrations well below the legal intoxication limit of .10% (some locations are .08%). The special alcohol-reactive chemical that is used to coat the crystals in the SafeWay units is unaffected by heat and cold and the shelf life is unlimited. 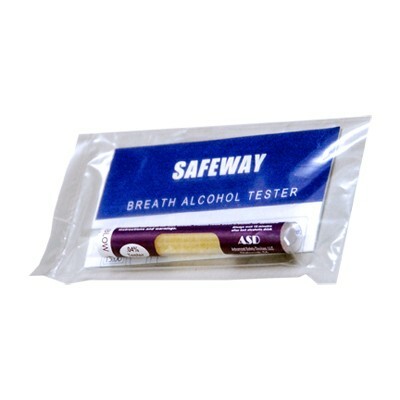 The low cost SafeWay alcohol test uses a highly specific chemical reaction to reduce the risk of false positives. The ethanol molecules in the subject's breath are oxidized to acetic acid and water. This reaction produces a color change that is unambiguous, providing clear evidence of alcohol use. An important design element in any breathalyzer test is sanitation. The SafeWay is a convenient, disposable solution for screening groups of people without the risk of spreading communicable disease. The single use nature of our product ensures safety when large groups of people need to be screened for alcohol use. The SafeWay is compact and can easily fit in a shirt pocket or purse. This alcohol testing unit is very affordable and can be purchased at a discount when bought in bulk. At a cost of only a couple of dollars, this miniature breathalyzer could save you or a friend the expense and complications of a DUI arrest. This model of breath alcohol tester is a great choice for alcohol screenings without the need for special training. Easy to administer and simple to interpret, this test can be effectively utilized in diverse situations. Many alcohol breathalyzers are either complicated to use or leave room for misinterpretation of results by inexperienced testers. We have worked hard to minimize these factors to produce a test that is simple and useful in both the public and private sectors. Using the SafeWay is very simple. First, wait at least 15 minutes after your last drink to prevent alcohol vapor in the mouth from distorting the test. Next, open the package and remove the SafeWay tube. The alcohol tests come in sealed sanitary packages for your protection. Squeeze the middle of the outer plastic tube between your thumb and forefinger to break the inner glass ampoule that contains the yellow crystals. Finally, take a deep breath and blow in one continuous breath into the tube. After two minutes, observe the color change of the crystals. We manufacture tests that detect levels from .02% to .08% blood alcohol concentrations. Choose the alcohol test that meets the particular level of compliance you need. In some types of work that have a strict policy against alcohol use the best choice would be the sensitive .02% test. The SafeWay system has been approved by the Department of Transportation and Food and Drug Administration. The accuracy and reliability of the breathalyzer tests are rigorously tested and must be periodically reviewed. This product has also been recommended for use by all U.S. government agencies including the U.S. military and the US Coast Guard. The disposable testers are ideal screening tools for quickly sorting out intoxicated individuals that can then be tested with forensic-quality evidentiary testing. This usually involves collecting blood samples under controlled conditions such as at a police station when an arrest for a DUI has been made. Using SafeWay alcohol detector is as easy as 1-2-3. Wait 15 minutes after your last drink. Open the package and remove the SafeWay tube. Squeeze the middle of the outer plastic tube between your thumb and forefinger to break the inner glass ampoule containing the yellow crystals. Take a deep breath and blow in one continuous breath. Wait for two (2) minutes. Observe the color change of the crystals. The crystals in the .02% tester will become an aqua (bluish green/greenish blue) color at an alcohol level of .02% or greater. The .02% tester is designed to report the lowest level of alcohol, and therefore does not report intermediate levels. If the crystals remain yellow, the alcohol level is below the detection threshold for the test or at 0%. If all the crystals turn blue (.04%, .05%, .08% tests), the subject's blood alcohol is above or equal to the designated %BAC for that particular test. Intermediate levels of breath alcohol exposure to the crystals in the .04% and higher SafeWay tests will change the crystals to a greenish color. If the color changes to an aqua (bluish green) upon testing the level of alcohol is at or above the rated level for the test. In cases where the .02% tester is being used, the presence of alcohol is indicated by the crystals changing to an aqua color. This colorimetric response makes this test ideal for quick determination of alcohol breath levels. Numerous independent laboratory tests have verified the accuracy and effectiveness of the SafeWay testing products. Without exception, they have found the SafeWay alcohol testers to have a high degree of accuracy and reliability.